__a_ i_ I _old you a __ory in a language I _an _ear? I am so honored to announce that I have been given a Minnesota Commission of the Deaf, DeafBlind, and Hard of Hearing (MNCDHH) Citizen Advocate Award for having done exemplary work in advocating for and with deaf, deafblind, and hard of hearing Minnesotans. You can read more about the award HERE. The exhibition catalog for my solo show Captioned at Granary Arts in available for purchase HERE. The catalog includes image still from the video as installation images at Granary Arts and an interview between curator Jason Judd and myself. Stephen Anderson reviewed my project Captioned - Twentieth Century for THE RIB. Granary Arts invites you to join us for "Captioned" a solo exhibition by artist Liza Sylvestre curated by Jason Judd. Captioned by artist Liza Sylvestre is a feature length, single-channel video interpretation of the 1934 screwball comedy film "Twentieth Century" starring John Barrymore and Carole Lombard. As an individual with a profound hearing impairment, Sylvestre depends on closed captioning or other interpretive texts to have complete understanding of films. In Captioned, the artist replaces the missing closed captioning in the movie with what she describes as "self-commentary". Sylvestre explains her process while creating the piece, "Sometimes I record what I think is happening, often I record my visual observations, and sometimes my mind wanders, and I record that as well." This fast-paced, dialogue-heavy comedy-complete with improbable and complicated narratives-affords Sylvestre many opportunities to reveal her experience enduring incomprehensible cinematic situations. Sylvestre's significant hearing loss progressed throughout her formative years until 2003, when she underwent cochlear implant surgery. Her experience leads her to explore, through a multidisciplinary practice in art, how senses alter experiences of the world-more specifically, how she can investigate this concept as, she states, "an individual who is medically, although not culturally, deaf." While viewing Captioned, an enabled audience encounters oscillating narratives: the narrative of the original film, the narrative of Sylvestre's experience, and the unique narrative produced by experiencing both simultaneously. All summer long I met with scientists studying sensory loss at the University of Minnesota’s Center for Applied Translational Sensory Science. 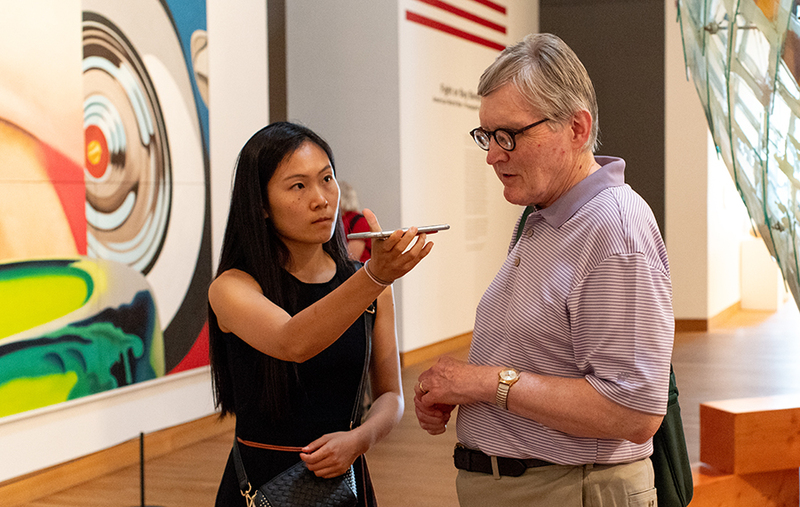 Work that resulted in the formation of a Sensory Loss Symposium for these scientists which was held at the Weisman Art Museum on September 13, 2018. A reflection on this work and a Q+A can be found HERE and HERE. Please email rachelmlinds@gmail.com if you’re interested in hearing about additional opportunities to see the exhibition. A Place for Us is a collection of works establishing or re-establishing place based identity for each of the artists. Each artist is expressing the way their bodies take up physical space and perform in the public sphere. All artists featured are MFA candidates and recent recipients from UIUC. It is these artists' sincerest wish that each visitor to this show consider the subtleties of their own daily public performance in their everyday spaces. of directors of visual arts at Art Omi (an artist residency in Ghent, New York) and the advisory boards of artfcity (an online, art-related publishing platform) and Trestle Gallery in Brooklyn. For the last fifteen years, she was a director of Mixed Greens gallery where she curated over one hundred exhibitions while managing a roster of nearly two-dozen emerging to mid-career artists. Heather received a BA from Brown University and an MFA from Pennsylvania State University. Her career began at contemporary galleries Sonnabend and Lehmann Maupin, both in New York City. Managed by the Logan Square Chamber of Arts, the Hairpin Arts Center offers arts and cultural programming year-round. The Logan Square Chamber of Arts’ mission is to enhance a vibrant and diverse arts landscape for artists by providing space, finding resources, and creating opportunities for collaboration, for the sake of great art. of Art + Design at UIUC. The artists of A Place for Us would like to extend a special thank you to the donors who made this fund possible, Herb and Lisa Murrie. Herb graduated in 1957 with a BFA in Advertising Design. My video Wha_ i_ I _old you a __ory in a language I _an _ear has been selected for the Film and Video Poetry Symposium. This is a two day long event, April 26 and April 29th, 2018 in Los Angeles, Ca. In our current divisive social and political landscape, the newest exhibit at the Milwaukee Institute of Art & Design (MIAD) asks viewers to do what lately seems rather difficult: feel empathy. "Humanly Possible: The Empathy Exhibition" is on view in MIAD's Frederick Layton Gallery January 12 – March 10. The public reception is Friday, January 19, 5 – 9 p.m. on Winter Gallery Night. "Humanly Possible: The Empathy Exhibition" is sponsored in part by the Mary L. Nohl Fund of the Greater Milwaukee Foundation. "The best way to avoid empathy is to avoid sensorial contact," says exhibit curator John Schuerman. In this exhibit, viewers cannot avoid such contact. Instead, they are immersed in the works of 12 artists who have varied perspectives. While internalizing the experiences of others through art, viewers are challenged to engage their potential for empathy, and ultimately decide whether to exercise it. Participants include seven artists from the exhibit's original Minneapolis run and five new artists, like recent Mary L. Nohl Fellowship winner Lois Bielefeld of Milwaukee. Her photography and digital media work explores the power and complexity of gender identity. Raoul Deal, also of Milwaukee and new to the exhibit, displays large-scale woodcuts that address the difficulty of celebrating one's Mexican heritage in a society that can be hostile toward immigrants. Work by Juliane Shibata, Tina Blondell, Inna Valin, Chase Boston, Christopher E. Harrison, Nooshin Hakim and Peter B. Nelson (all from the original exhibition) and Liza Sylvestre, Gudrun Lock and Sue Coe (new to the exhibition) is also on view. Thursday, February 1, 6 p.m. – Empathy Through the Visual Arts: An Artist's Discussion Three of the exhibition's artists (Lois Bielefeld, Tina Blondell and Gudrun Lock) along with curator John Schuerman and moderator Leslie Fedorchuk discuss the concept of empathy and its manifestation in the visual arts. Reception to follow. Thursday, February 15, 7 p.m. – Empathy, Connections and Borders: An Evening of Poetry and Storytelling A night of visual and oral storytelling between artists and writers from Milwaukee and Minneapolis exploring empathy, creating human connections and crossing borders. Performers include Michael Kleber-Diggs, Anais Deal-Marquez, Kavon Cortez-Jones, Dinorah Marquez, Isela Xitlali Gómez and Eli Avalos. Thursday, March 1, 7 p.m. – 100 Lullabies (Lullaby Songs for Refugees) An experiential platform for listening to stories of war, face to face with artists who grew up during war in the Middle East. Audience members will be invited to sing and record a song of comfort or lullaby in their own language for children who are affected or displaced from their motherland by war. Participants include: Nooshin Hakim Javadi, Pedram Baldari and Katayoun Amjadi. MIAD's galleries are free and open to the public, Monday through Saturday, 10 a.m. – 5 p.m. Free gallery tours are available at miad.edu/gallerytours. Article covering the exhibition published in the Milwaukee Journal. My solo show Interference opens at SooVAC on July 29th. Artist talk starts at 5:00 with the opening reception to follow at 6:00. Featuring works by Liza Sylvestre, Cory Imig, Karen Spiering, Preetika Rajgariah, Sue Kay Lee, Courtney Cross, and Dulcee Boehm, curated by Sharmyn Cruz Rivera. Between the Sky and the Earth considers the mutually constitutive nature of human identity and locality and how this relationship is critically informed by the production of space, culture, gender and language. Dealing with spatialized subjectivity is central to these artists’ work, who through visual poetics, site-specific intervention, and inquiries of materiality, point at desire as the axis of human’s relationship to land. Although Western civilization has corrupted this desire with its hunger for conquest, at its core this longing is rooted in the need to belong. The impetus to belong connects us to a network of spaces which, once organized, produce place. This longing illuminates humans fractured relationship to land and nature. The intensity of this divorce coupled with capitalist ideals “exacerbate the effects of the alienation and fragmentation in contemporary life” (Miwon Kwon). Yet, we question with urgency how our identity is bound to locality and how cultural production fits within globalization’s vision. Liza Sylvestre’s work collapses language to destabilize content and amplify miscomprehension, exposing the fragility and vulnerability of communication. Preetika Rajgariah’s use of language is compromised by the textiles she uses, delving into politics of gendered materiality and exoticization. In Courtney Cross’ video the artist performs a long burial ritual that reunites the body with the earth, a meeting that may not signal death itself. Cory Imig’s intervened photographs subvert the space represented and propose an alternative version of the landscape. In a similar vein, Dulcee Boehm photographs of potholes pose the paradox of superfluous labor and how this transpires contemporary production of space. Sue Kay Lee’s textile sculpture shows different hand poses that conflate the politics of gesture and hermeneutics of non verbal communication. The exhibition is accompanied by the publication of an artists’ book featuring work by the seven exhibiting artists and seven Chicago-based artists: Ruby Thorkelson, Carla Fisher Schwartz, Bobby Gonzales, Rami George, Danny Giles, Matt Brett, and Jessica Harvey.